Google oh Google oh Google. When did it turn out that Google completely controlled how we run our sites? Google has the power to shut down your website if they suspect it’s spreading Malware. But there are weird kinks along the way. Sometimes you can ask them to remove the warning and they actually do in a timely manner. Yesterday, I had the warning up on my other site, awards daily.com, for an entire 24 hours before it even showed up on Google’s own webmaster tools. That meant I couldn’t request a review except to go to their forums. I did that and they kept coming back at me with additional scans where they supposedly found malware. 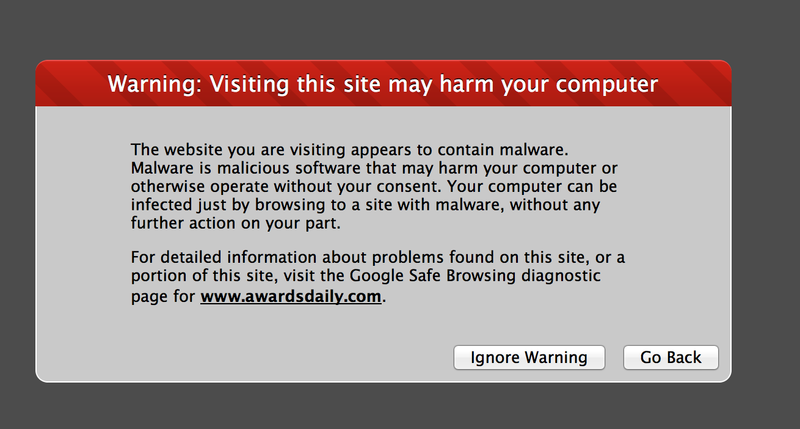 But my security team that protects my site, the awesome Securi, said that what they found wasn’t Malware. I have requested the warning be removed but this will be 48 hours later — traffic is dying by the minute. Yes, I understand they want to protect everyone else from Malware – I get it. What freaks me out is how much power Google has now. It should freak you out too.